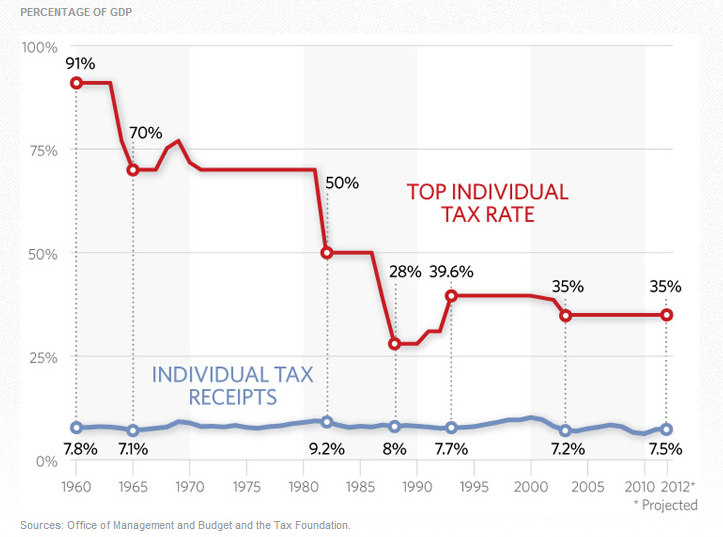 No, we never had 70+% tax rates on the rich. Well, it’s utter nonsense. Thanks to tax deductions, credits, etc the effective top marginal tax rate, which is the tax rate people actually paid after they earned a certain amount of money, has historically never been above 30% (see below). As you can see, the top marginal effective tax rate is entirely independent of the top marginal rate. That doesn’t even mean that rich people pay 30% of their income to the government, only that 30% of their income goes to the government after they earned a certain amount of money. Currently, the first $400,000 a person earns is subject to lower tax rates. The top marginal tax rate only applies to a person’s income after they earn $400,000. In the past, one had to be a multimillionaire in order for his income to face the top tax rate. For example, in 1936 one had to earn over $80 million (adjusted for inflation) for his/her income to be subject to the top tax rate. 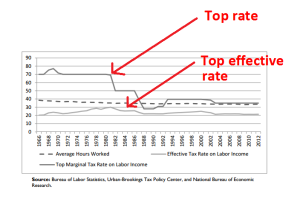 Thus, comparing top tax rates over time is utterly nonsensical. 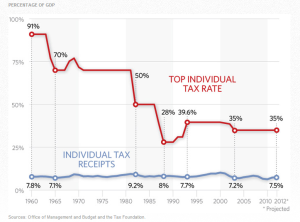 In the supposed era of prosperity, the 60’s, in which the rich supposedly paid a tax rate of over 90%, individual income taxes as a percentage of national income were almost exactly the same as in later dates where the tax rates had been lowered. 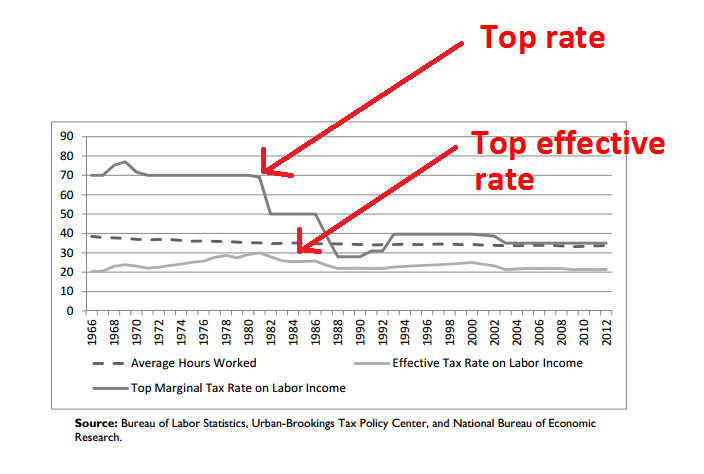 This suggests that either the rich did not pay these high rates, which we know to be true, or the amount of income subject to the top tax rate was so small that changes in the top rate did not produce significant changes in the amount of revenue from income taxes collected, which we also know to be true. Regardless, using past top tax rates to justify higher taxes on the rich in the present is absolutely nonsensical. A 2011 survey of the academic research on the relationship between taxation and economic growth makes similar findings. Thus, while leftists may want to impose confiscatory taxes on the rich, they cannot seriously claim that their taxes have been dramatically higher in the past, nor can they seriously claim that taxes do not harm the macroeconomy.